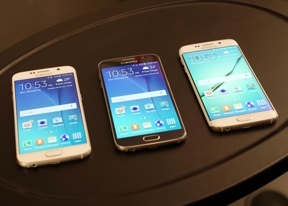 Samsung Galaxy S6 is the "conventional" member of the family. The smartphone is going to be available in four colors - White Pearl, Black Sapphire, Gold Platinum, and Blue Topaz and when it hits the shelves. The newcomer looks and feels impressive in the flesh - the combination of glass and metal has truly done wonders for its visual appeal. The same goes for its tactility. There are no surprises with the 5.1" QHD Super AMOLED display. The unit is gorgeous to look at, with vibrant colors, superb viewing angles, and stellar contrast. Above the display is where the usual bevy of sensors can be found. The earpiece and the front-facing 5MP f/1.9 camera are there as well. The home button of Samsung Galaxy S6 has grown considerably in order to accommodate the new fingerprint sensor. The latter is much better than the one found in the previous model - its functionality rivals that of Apple's iPhone. Having a non-removable back cover means that the SIM card slot is located on the side of the Galaxy S6, right below its power/lock key. The volume rocker sits alone on the left side of the device. The top of the smartphone is where the IR port and a microphone pinhole reside. The 3.5mm audio jack has been moved to the bottom alongside the device's sole speaker and microUSB port. Samsung promises a greatly improved speaker in the Galaxy S6 over the previous generation. The unit is 50% louder, which, combined with its new location, promises much better overall experience. The back of the phone is where the lightly protruding 16MP f/1.9 main camera with 4K video resides. It features optical image stabilization, so the expectations for its low light performance are high. The camera features a slightly tweaked, though familiar interface. Samsung has implemented a nifty new start gesture for its snapper - double tapping on the home button activates it in seven tenths of a second. Physical measures of Samsung Galaxy S6 are 143.4 x 70.5 x 6.8mm. Its weight tips the scale at 138 grams. In a manner befitting a flagship smartphone, Samsung Galaxy S6 will ship with a bevy of accessories. They include stock Samsung fare, as well as ones developed in collaboration with industry heavyweights. The range of available cases is truly extensive. It covers everything from mass-market offerings by Speck, Tech21, and Otterbox, all the way to bona fide luxury options from Montblanc and Swarovski.